From A Greek Debt Crisis To A Eurozone Structural One? When we look back five years from now, will we see this week as marking a turning point in the short, but far from uneventful, ten year history of Europe’s common currency? Certainly recent comments by the deputy governor of the People's Bank of China have made evident what was already implicit: the dependence of EU sovereign debt on sentiment in global markets, especially in Asia and the Americas. Simon Derrick, chief currency strategist at Bank of New York Mellon even went so far as to say the trauma of recent days might well signal the point that we stop talking about a “Greek debt crisis” and start talking about a “Eurozone structural crisis” . And while Herman Van Rompuy, president of the European Council, was telling us on the one hand that the eurozone will never let Greece fail, Jane Foley, research director at Forex.com busied herself explaining, on the other, that any involvement of the International Monetary Fund in helping Greece to stabilise its fiscal position only heightens the risk that the country might one day end up leaving the eurozone. So just where are we at this point? Basically it is important to recognise that the current crisis has placed the spotlight on the severe institutional weaknesses which lie underpin the common currency, and it is just these weaknesses which are leading so many commentators to now ask themselves whether it might not have been easier to implement political union in Europe before embarking on such an ambitious monetary experiment. These weaknesses became even more clear on Thursday when Jean Claude Trichet went very public in making clear that he personally is totally opposed to IMF participation in any Greece "rescue". “If the IMF or any other authority exercises any responsibility instead of the eurogroup, instead of the governments, this would clearly be very, very bad,” he said on France’s Public Senat television. And this on the same day as Angela Merkel and Nicolas Sarkozy were publicly celebrating the triumph of the "Franco-German" entente. Clearly there are still many rivers left to cross before we can say we have reached the other side in this particular structural crisis. Basically the issues facing Greece are now not primarily fiscal ones. The issue is how to get growth back into the economy fast enough to stop deflation and the economic contraction taking away all the good work acheived through fiscal cutbacks, and how to finance Greek borrowing at a rate of interest which stops the level of indebtedness spiralling upwards out of control. The Economist magazine have done their own calculation on this, and they estimate that a loan of €75 billion rather than the currently rumoured €25 billion will be needed and that the country is likely to need five years (rather than three) to get its deficit down below 3% of GDP. They also assume that Greek GDP will be 5% below its current level by 2014. Obviously the output you get in these sort of calculations rather depend on the expectations you put in, but these are not unrealistic expectations. As I explain in this post on the debt snowball problem, only two things really matter at this stage, the rate of change in nominal Greek GDP (that is non price adjusted) and the rate of interest charged on the sovereign debt. As regards nominal GDP, the Economist assume a 5% contraction in 2010. This may seem rather steep, but it does include an anticipated fall in prices as well as a drop in GDP. My own calculations suggest a drop in real GDP of about two percent, rather than the somewhat higher numbers others are talking about. I suggest this number is more realistic given the degree to which the trade deficit is likely to correct, and the net trade impact on headline GDP numbers. As far as prices goes, I think a one percent fall in the CPI is a reasonable guess at this stage. 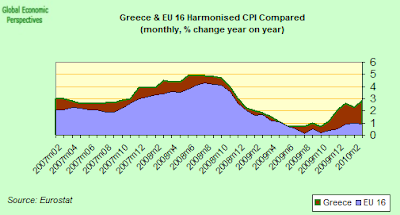 If you look at the chart below you will see that interannual Greek inflation is still well above the EU 16 average, but prices have now been falling since November, and even though we shouldn't neglect the impact of tax and public sector tariff increases, prices will almost certainly be down in December 2010 over January. The big difficulty is estimating by how much. One of the key issues facing Greece at the moment, with large parts of its outsanding debt needing to be refinanced, is just what rate of interest (or extra spread) will have to be paid on any loan (I deal with this question in this post). This is almost a key question, since it can become a "life or death" issue in determining whether or not the country will be forced into default. But here both the EU and the IMF have a problem, since if the Euro Group countries make a loan at a level near to the the current price charged for German debt (which is what should happen if we argue Greek debt carries no additional risk since we are all guaranteeing it), then other countries who are currently paying more (Spain, Ireland, Portugal, Austria etc) may ask why they also could not have such favourable treatment. On the other hand, asking the IMF to make a cheaper loan causes problems, since it could be seen as subsidising Europe in sorting out its problems, and this might not be easily understood in Emerging Economies where there are evidently many more needy cases than Greece's to think about. The bottom line is that there is no easy answer here, and Europe is struggling to convince the rest of the world that it has both the will and the instruments to effectively tackle the problem of maintaining a single currency in a diverse group of countries. Herman Van Rompuy said on Friday there was no danger of Portugal being sucked into the same sort of debt whirlpool as Greece, and that Portugal would not be the next country to be sent over to Washington in search of a helping technical hand from the IMF. Which raises the question: if it won't be Portugal, who will it be? If you're really good at making a pigs ear of things, why not join the EU? Of course, this is not meant as a piece of solid advice, rather it is a cry of frustration at being impotently forced to watch so many things done so badly, each in turn, and one after the other. Southern Europe's problem is essentially a competitiveness problem, and not a fiscal one, and if many states have been having growing difficulty with their negative fiscal balances, this is a symptom of the problem, and not its cause. Even in the worst of cases - countries like Greece and Portugal - the rising recourse to fiscal outlays has been a response to lack of "healthy" growth, and the root cause of this continuing difficulty in generating real growth has been the underlying lack of competitiveness, and the inability to export your way out of trouble once the burden of debt starts to rise, so simply pruning the fiscal side isn't going to cure the problem, and by now that simple point should be obvious, I would have thought. Naturally a lot of financial markets attention has been focusing recently on whether or not the Euro is about to unravel. Even the ever-so-prudent Ralph Atkins winds up his mamoth "Defiant Berlin" review with a quote from Jörg Krämer, chief economist at Commerzbank in Frankfurt who says the next few years may see the eurozone becoming more of a “transfer union”, one in which better performing countries have to help out weaker members. “That" - he argues - "could mean Germany says, ‘we are no longer willing to support the weaker parts of the EU’, while the Greeks say that they are not prepared to have policy dictated by the Germans," Thus: “The risk cannot be totally excluded of a eurozone break-up within 10 to 15 years – and this is a consequence of widening eurozone divergences.” To which Atkins adds "If that risk rose, Europe would be facing a very different ballgame". You bet it would! To some extent I cannot help feeling that a congenital inability to take bite-the-bullet type decisions is resulting in an ongoing process of passing the buck ever onwards and upwards. The latest exemple here is the issue of IMF involvement in the Greek adjustment process. Now, as with any issue, there are good reasons and there are bad reasons why IMF involvemnet might be considered desireable. Among the good reasons are the vast experience and technical expertise of the fund, or the fact that representatives of the IMF might find it easier to say "no", given that the underlying sovereignty issues are not exactly identical when posed in terms of the IMF as they are in terms of the EU. But among the bad reasons would be the idea that the IMF could fund any eventual Greek loan more cheaply. As far as I can see, a lot of the EU interest in having an IMF loan to Greece stems from the need to make the rate of interest applied cheap enough to bring the spread down. This is an important concern, since it is not obvious why a country which is making its best effort to put things straight should need to be paying an exorbitant charge for the money it borrows while it does this. Earlier this week European Central Bank President Jean-Claude Trichet spoke out strongly against offering the kind of low-interest loans for which the Greek government has been pressing - “There shouldn’t be any subsidy element, no concessionary element” in any eventual loan to Greece, he told members of the Economic and Monetary Affairs Committee of the European Parliament. And maybe this is the only reasonable position the ECB can take (given its Charter), but evidently the Eurogroup of countries are not bound by the same constraints and they themselves could do this (via recourse to Group-backed EuroGroup bonds, or whatever), which raises the obvious question: why don't they? Well, one of the reasons lying behind all the reluctance we are currently seeing may not be the issue of the German constitution, or even the question of changes to the Lisbon Treaty, or any of the major issues of principal which arise and would require lengthy and onerous debate. Maybe the question is a much more simple one: perhaps Europe's leaders are simply worried that if they make a cheap loan to Greece, then Spain, Portugal, Ireland, Italy, Austria, Slovenia and Slovakia may all soon argue they also need one. My view is that this is an issue where the EU itself needs to bite the bullet, and make large changes, ones which lead, as Wolfgang Munchau has been arguing, to much closer political union. If we need the IMF in Greece, and I think we do, it is for its proven capacity to implement programmes, and its extensive technical resources, NOT for the money. "the US, Britain, ANZ and everyone else in the IMF who is not in the Eurozone.... (decide to)... legitimately ask why the effective subsidy of Greece by its Eurozone partners should be transferred to the rest of the world ... (after all) .... the Europeans have enough clout in the IMF to, say, insist some of their own IMF-directed resources be directed towards Greece specifically, which would spell the unravelling of the IMF if it became a general habit." On a slightly different, but somewhat related topic, I basically agree with a lot of what Martin Wolf wrote in his Excessive Virtue piece in the FT yesterday. As Martin points out, in saying "nein" to those who suggest that its economy should become a little less competitive what the German government is effectively saying is that the eurozone must become some kind of greater Germany - a huge export machine which generates a massive surplus with the rest of the world, a surplus which enables all those highly indebted member countries to pay down their debts. But, as Wolf argues, this policy would have profoundly negative implications for the entire world economy. "An alternative solution might be to help the world absorb larger export surpluses from the eurozone, the US, Japan and the UK. True, no sustainable exit from the present quagmire can be envisaged without increased net capital flows into emerging countries. It also seems evident that this is where the world’s surplus savings ought to end up. But it is going to take time and much reform to make this happen." Really, I entirely agree, but a quantum leap in thinking is necessary here. If the books are to balance - and if we want growth and pensions in the OECD then they have to - what we need to do is help cheaper finance reach those countries with capacities to grow and absorb others exports, while the EU takes on in-house responsibility for sorting out the financing (but not necessarily the disciplining) of its own members. That is, if cheap loans need to be provided to anybody it is to those in need in the Emerging Countries, and not to Europeans who have happily spent their own way into difficulty. In fact, in my New Year questions to Paul Krugman I raised some sort of similar point, but unfortunately his response was not exactly positive. 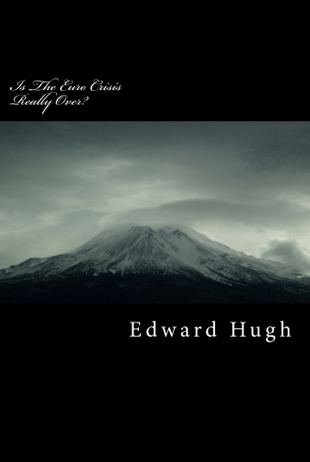 E.H.: One of the standard pieces of economic observation about countries recovering from financial crises is that their recoveries are export driven. This has now almost attained the status of a stylised fact. But as you starkly ask, at a time when the financial crisis is generalised across all developed economies - whether because those who borrowed the money now have difficulty paying back, or those who leant it now struggle to recover the money owed them - to which new planet are we all going to export? Maybe we don’t need to look so far afield. Many developing economies badly need cheap and responsible credit lines, and access to state-of-the-art technologies. Do you think there is room for some sort of New Marshall Plan initiative, to generate a win-win dynamic for all of us? P.K. : Um, no. Not realistically as a political matter. We’ll be lucky if we can get the surplus developing countries to spend on themselves. My guess is that our best hope for recovery lies in environmental investment: taking on climate change could, in terms of the macroeconomic impact, be the functional equivalent of a major new technology. So the solution to our problems is not politically realistic. And meantime we keep trying to play around with policies which simply won't work. It is now pretty clear to me at least just how so much valuable time was lost back in the 1930s, thrashing around playing with solutions which didn't, and wouldn't, work. As Krugman himself likes to say, "history has a habit of repeating itself, the first time as tragedy, and the second time as yet another tragedy". As Irwin Stelzer argued in a recent opinion article in the Wall Street Journal, Spain’s Prime Minister José Luis Rodríguez Zapatero seems to be an admirer of Charles Dickens's character Mr. Micawber. When asked what he plans to do about Spain’s 11.4% fiscal deficit, first he promises to extend the retirement age, only to later tell us the measure may not be necessary. Then he promises a public-sector wage freeze, only to have his Economy Minister, Elena Salgado, say he really doesn't mean exactly what he seems to say. And in any event, we shouldn’t worry too much, since given that Spain is a serious country, somehow or other the fiscal deficit will be cut to 3% by 2013, even though most serious analysts consider the economic growth numbers on which the budget plans are based to have their origins more in the dreams of an Alice long lost in Wonderland than in any kind of sobre analysis of real possibilities. "We do have a plan," deputy prime minister, Maria Teresa Fernandez de la Vega assures us, but to many that plan now seems to be little better than hoping, like the proverbial Mr. Micawber, that "something will turn up." 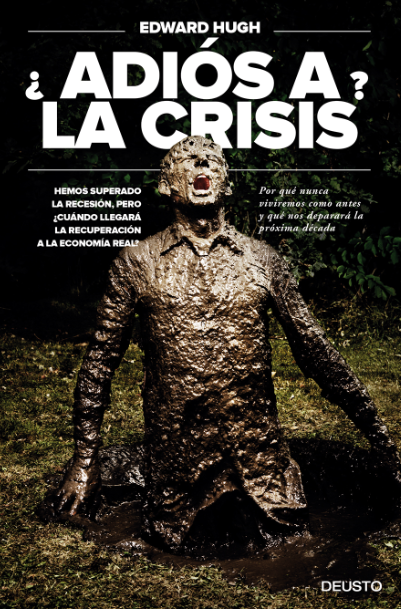 The lastest to draw attention, to the problematic nature of this "wait and see" approach - and to the gaping hole which is now yawning in Spain’s national balance sheet - is the credit ratings agency Fitch, who only last week warned that many Western governments now face unsustainable debt dynamics following measures taken to address the financial crisis. The agency singled out Britain, France and Spain as being in special and urgent need of outlining plans to strengthen their public finances if they don’t want to risk losing their current highly prized AAA ranking. This strong and direct warning was issued by Brian Coulton, Head of Global Economics at Fitch, who said "High-grade sovereign governments need to articulate more credible and stronger fiscal consolidation plans during the course of 2010 to underpin confidence in the sustainability of public finances over the medium-term and their commitment to low and stable inflation. The UK, Spain and France in particular must outline more credible fiscal consolidation programmes over the coming year given the pace of fiscal deterioration and the budgetary challenges they face in stabilising public debt." Yet, while criticising Portugal's gradual approach to fiscal consolidation as a matter of "concern" Fitch senior director Paul Rawkins also argued that the Spanish govenment had acted swiftly in announcing plans to consolidate public finances. Nonetheless he did still warn that the economic risks facing Spain remain very high, especially since the pace of decline in tax revenues is dramatic enough to be preoccupying, while continuing “labour market inflexibilities could well prolong the economic adjustment”. The current problem facing Spain (and other similarly affected countries) has its roots in two quite distinct sources. In the first place measures taken to counteract the impact of the financial crisis have been inadequate and have simply produced large short term deficits. However to this short term liquidity and adjustment problem must now be added the further dimension of longer term impacts on public finances which have their origins lie in ageing populations, and the effect on economic growth of having older and smaller working-age populations. Regarding the first, as Willem Buiter, now chief economist at Citi has pointed out, more than 40 per cent of global GDP is currently being produced in countries (overwhelmingly advanced economies) running fiscal deficits of 10 per cent of GDP or more. Over most of the last 30 years, this level fluctuated in the 0-5 per cent range and was dominated by debt form emerging economies. So the crisis marks a watershed, from which there will likely be no turning back, and in many ways could not have come at a worse moment for those countries who still have to undertake substantial pension reform to put their nation finances on a solid footing when faced with the unprecedented ageing which lies ahead. 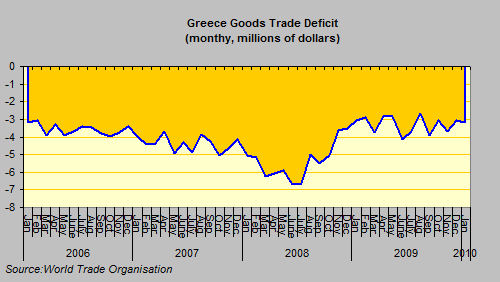 Indeed, to take the Greek case, while the short term fiscal deficit has been the focus of most of the press attention, the longer term problem associated with the funding of Greek pensions far outweighs issues associated with the falsifying of national accounts in the early years of this century. A recent report by the European Commission found that Greek spending on pensions and health care for its ageing population, if left unchecked, would soar from just over 20 percent of GDP today to around 37 percent of G.D.P. by 2060. And Greece is simply an early warning indicator of troubles to yet to come, in larger countries like Germany, France, Spain and Italy who have all relied for decades on pay as you go type state-financed pension schemes. Now, governments across Europe are being pressed to re-examine their commitments to providing generous pensions over extended retirements because fiscal issues associated with the downturn have suddenly pushed at least part of these previously hidden costs up to the surface. In fact, unfunded pension liabilities far outweigh the high levels of official sovereign debt. According to research by Jagadeesh Gokhale, an economist at the Cato Institute in Washington, bringing Greece’s pension obligations onto its balance sheet would show that the government’s debt is in reality equal to something like 875 percent of its gross domestic product. That would be the highest debt level in the 16-nation euro zone, and far above Greece’s official debt level of 113 percent. Other countries have obscured their total obligations as well. In France, where the official debt level is 76 percent of economic output, total debt rises to 549 percent once all of its current pension promises are taken into account. 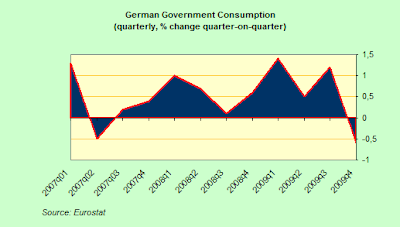 Similarly, in Germany, the current debt level of 69 percent would soar to 418 percent. Of course, these numbers are arguable, and may well be in the excessively high range, but the fact still remains: outstanding and unfunded liabilities are huge, and would have been difficult to honour even without the present crisis. As it is, we are now in danger of spending the seedcorn which could have been harvested later on down the road. Public opinion has yet to assimilate the seriousness of the issues involved here. As Pimco Chief Executive Mohamed El-Erian said in a recent FT Opinion article, the importance of the shock to public finances in advanced economies is not yet sufficiently appreciated and understood. With time, this issue will prove to be highly consequential. The latest Fitch report is simply another warning shot. The sooner we all recognise the, the greater the probability of our being able to stay ahead of the disruptions this adjustment to reality will cause. It is time to stop simply waiting around to see what is going to turn up, since if we do continue like this we won’t like what we eventually find. Well, I for one can't help thinking that it's now well time we all stopped getting carried away with the use of so many acronyms. Not only may one man's meat easily prove to be another's poison, it may even be that for some the entire meal will be so distasteful as to prove totally indigestable. And so it is with the latest set of proposals to appear on that diagnostic lab bench which has been hastily erected in the search for that magic "cure all" for the eurozone's many ills. 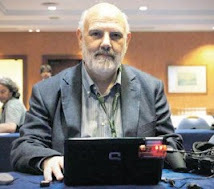 Daniel Gros, in a well meaning, but I feel fatally flawed, move to get us all away from talking about some of the members of our own community as if they were PIGS, has decided to tell us that they are not pigs at all, they are merely GIPSYs. Of course, depending on which way you look at it, such forms of reference could be taken as a compliment ("you sure do eat like a pig"), or not, but stopping to think for a moment about the kind of controversy which has been provoked by the arrival of large numbers of Roma in Italy, perhaps telling the countries which lie on Europe's periphery that the best way to conceptualise them is as a bunch of "gitanos" is not the best way to get reasoned debate going. Nor is it necessarily the best way to do this to tell the members of core Europe that they as things stand they are essentially F-UK-De. But there it is. That's just how things are these days. It's not often that I await the ECB after-meeting press conference statements of Jean Claude Trichet with such an intense feeling of anxiety and bated breath. But this time, as the song goes, it will be different. This time there are plenty of reasons to think that, having been the first off the mark in looking for the exit, Europe's monetary leaders may sound a note of caution at tomorrow's meeting, and indeed indicate there may well be solid grounds for at least taking a time out, if not engaging in a longer process of pausing for extended thought. My advice: if you don't actually have any pressing need to hit the eject button, then don't do it. In the first place we have the latest batch of Eurozone PMI data, which suggest that the process of economic recovery is going to be neither so rapid, nor so straight forward, as was initially thought. And even more to the point, exit from the recession is being more characterised for its unevenness than it is for its uniformity. 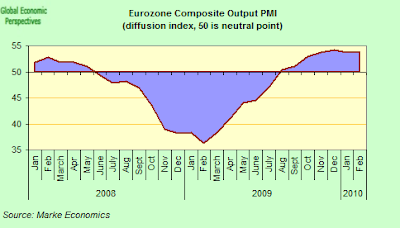 Growth in February was heavily weighted to the manufacturing rather than the services sector, and in manufacturing there was more dynamic in demand from the ex-Eurozone export area, than from internal orders, suggesting that the 6% drop in the Euro is having a positive impact on external competitiveness, while domestic demand remains weak and lacklustre. In the second place, in addition to the generally weaker condition of the services sector, there are pronounced general weaknesses in some countries: Spain, Greece and Ireland are obvious cases (and Greek manufacturing even managed to lose ground in export markets in February), but output and activity in Portugal and Italy also look quite fragile at this point. 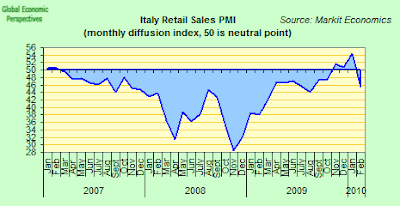 In Italy the phasing out of the car scrappage scheme had a strongly negative impact on February sales in the Italian retail sector, with the PMI dropping sharply from 54.4 in January to 44.5, and after three succesive months of increase sales now seem to be solidly back in contraction mode. Even more worryingly, firms operating outside of the autos sector also noted in their responses to the survey that weak consumer sentiment had been a key theme in February. Slow but solid as the growth in the EuroArea has been, the performance has hardly been spectacular, and we are a long, long way from a "V" shaped rebound. In addition, outside of France there has been little evidence of any sort of solid, home-grown, domestic consumption growth, and the general picture is one of overall fragility, with the continuing danger of relapse back into quarterly contraction. All of which offers us the background for a fairly extended series of headaches for policymakers over at the ECB. Indeed members of the Governing Council may well be having a hard time of it deciding what their next move should be. Having moved policy steadily up to the door marked "crisis exit this way", they may well be having second thoughts about whether this is exactly the right time to cross the threshold. Indeed as Ralph Atkins noted on the FT Money Supply blog, the European Central Bank has gone strangely quiet. Since the beginning of December ECB board members have collectively made fewer speeches than in any three month period since the global financial crisis erupted in mid-2007. According to the ECB website list, since the start of the year Jean Claude Trichet has made only one full-scale address - in Sydney earlier this month - and even then his remarks were overshadowed by his decision to return early to join eurozone leaders in talks on the Greek crisis. In the first two months of last year, Mr Trichet gave at least nine speeches. So why the comparative silence? The ECB is not normally reticent in coming forward to guide market expectations. Could the communication pause reflect growing uncertainty among board members about what to do next? With Greece and other countries in Southern Europe having so many problems returning to growth no one is very clear anymore what the ECB exit strategy is actually going to be. And obviously, if you aren't clear about something then maybe it is better not to talk about it. And the ever vigilant markets are noticing the change in stance. Previously, the European Central Bank was seen as delaying an increase in interest rates out of concern for some of Europe's weaker economies. But with the German economy now in a stall, and Italy's possibly back in recession, expectations for ECB rate increases have been driven further and further back, and financial markets are not now expecting the first increase in the ECB’s main policy rate until September next year. The recent announcement that Eurozone annual inflation slipped from 1 per cent in January to just 0.9 per cent in February - undershooting to an even greater extent the ECB’s goal of a rate “below but close” to 2 per cent - have only reinforced their view. If there is little inflation danger, and the recovery is week, then what is the point in raising rates? In addition, the prospect of sizeable fiscal tightening in many EMU countries will also act as a disinflationary force in these countries in coming months, pressuring the euro downwards and keeping up the pressure on the ECB to stay on hold until at least next year. Aggressive fiscal tightening by Greece, Spain and Portugal looks likely to plunge all these economies back into even deeper recessions. All else being equal, this calls for a looser monetary policy, as does the need to at least keep the euro where it is, and stimulate export activity to destinations outside the monetary union. Beyond the interest rate issue, Jean-Claude Trichet is also scheduled to announce further steps to gradually return liquidity provision to pre-crisis levels for eurozone banks. “Timely” action, the ECB argues, is justified as financial markets normalise and the risk grows of distorting investor behaviour. The ECB stopped providing 12-month liquidity in December, and Thursday’s governing council meeting is in theory going to consider toughening the terms of what is planned to be a final six-month liquidity offer, as well as scaling-back the three-month and one-month liquidity offers. The bank will also have to give serious consideration to how to cope with the expiry on July 1 of its first 12- month liquidity offer, which saw €442bn pumped into the system a year earlier – the largest amount ever in a single ECB operation. And Spain's banks don't stop drinking at the fountain. 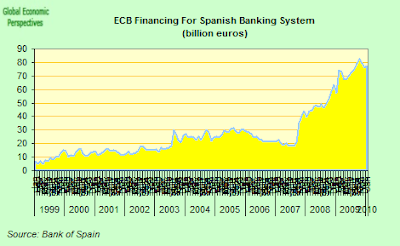 According to the latest data from the bank of Spain, the dependence of Spanish banks on ECB finance hit a new high in January - following the "last" one year offer in December - with €88.6 billion outstanding in longer term financing operations. To date they have only made use of some €77.3 billion of this (see chart below), but they have a further €10.5 billion parked on deposit at the ECB, ready to use as needed. Despite the apparent success of the recent EU delegation to Athens in achieving further cuts from the Greek administration, doubts remain about how 6 minus 2 can sum down to five, or, if you will, how growth and fiscal austerity can come together. And in particular how Greek (or Spanish, or Irish) banks, who in theory will no longer have access to the extensive liquidity provision whose benefits they have been so enjoying of late, will be able to cope. Between public and private sector financing needs, Spain will have to fund borrowing (including rollovers) to the tune of something like 50% of GDP this year. So, as Ralph Atkins puts it, despite the apparent success of the EU Commission in obtaining agreement on a further €4.8 billion package of austerity measures Greece is still far from receiving the all-clear. Ironically, market concerns will in all probability now shift to worries that Athens has gone too far in slashing budgets and raising taxes, and that the fiscal measures announced will simply act as a massive brake on economic activity. The risk is that Greece is now in a vicious circle in which fiscal austerity sends the country ever deeper into recession - and Athens has to react even more aggressively to bring down the public sector deficit as a share of GDP. There will be no easy-to-find Aristotelean mean here I'm afraid. So how will they play it? As I say, at 2:30 tomorrow afternoon I will be all ears, with my eyes totally glued to that ECB webcast. According to data released on Monday by the Swedish statistical office Sweden unexpectedly fell back into recession in the fourth quarter, adding to the impression there has been a growth dip among Europe's economies and raising further questions about the durability of the recovery in Europe. Gross domestic product contracted by a seasonally adjusted 0.6 per cent in the fourth quarter of 2009 (when compared with the previous three months), despite analyst expectations for growth of 0.3 per cent. 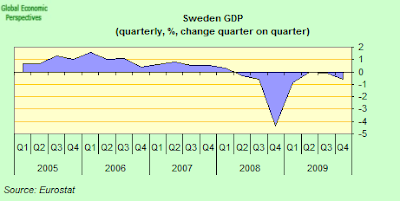 In addition the third-quarter figure was revised to a 0.1 per cent quarterly decline (down from an original 0.2 per cent gain) which means that Sweden is now back in recession. 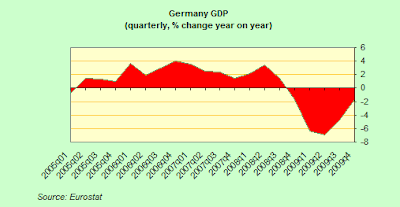 Year on year GDP was down by 1%, following a 4.8% fall in the fourth quarter of 2008. 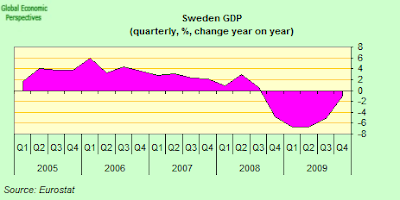 That is to say Swedish GDP is now down by just under 6% from GDP in Q4 2007. 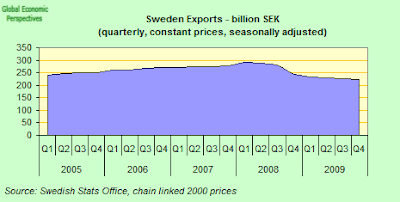 Exports seem to be a big part of the problem, despite the earlier devaluation in the Krona. In this sense my earlier optimism was misplaced. 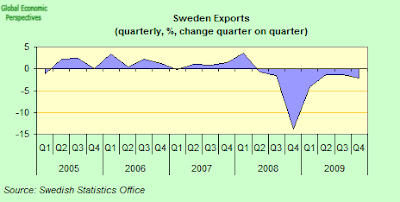 In fact, exports have fallen in every quarter since the start of the long contraction. Indeed, far from this expansion being export-lead, it is household consumption and government consumption which have been the positive components in growth. 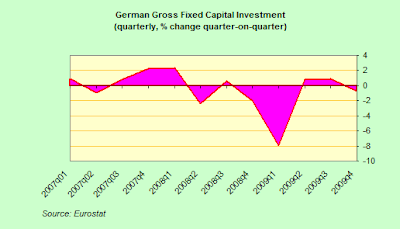 Capital investment is still contracting, as it is almost everywhere in Europe, which is one of the obvious weaknesses in the recovery. But I say "what is going on" in my title, since I am at this very moment going through all the February Purchasing Managers Index (PMI) results, and Sweden has come in, for the second month running, as the global leader, with a reading of 61.5, which in theory suggests a strong expansion in the manufacturing sector. 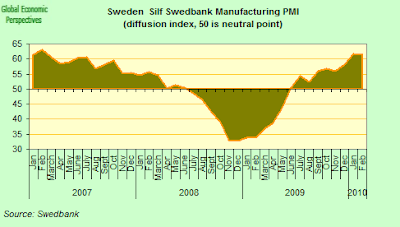 But it isn't only the January and February 2010 data which have been strong, if you look at the PMI chart (below) in theory Swedish manufacturing has been expanding since June last year. 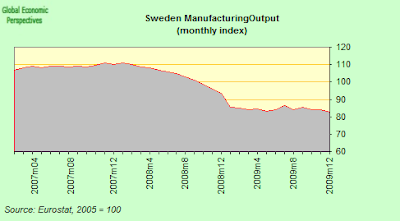 Yet if we come to look at the manufacturing output data as supplied to Eurostat, there is no sign whatever of any sort of recovery in Swedish manufacturing. Really I think SILF/Swedbank owe us all some sort of explanation for this state of affairs, since at the very least something must be way out of line in their methodology. And please note, this survey is NOT produced by Markit economics, whose PMIs are normally far more reliable. Global manufacturing activity continued to expand in February, albeit at a slightly weaker pace than in January. 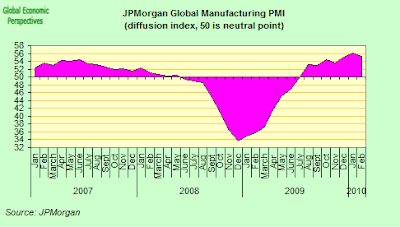 At 55.2, down slightly from 56.1 in January, the JPMorgan Global Manufacturing PMI posted its second highest reading in almost four years. 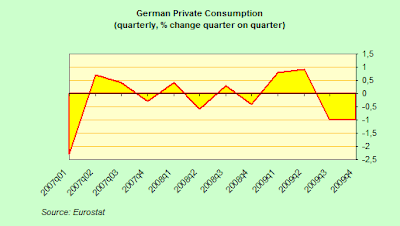 The average reading so far in Q1 2010 (55.7) is above that for Q4 of last year (54.2). 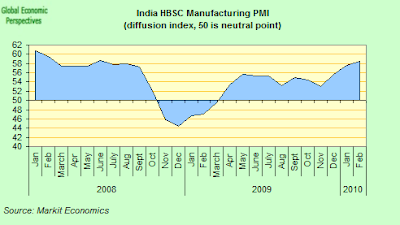 The headline Manufacturing PMI has now emained above the no-change mark of 50.0 for eight successive months. 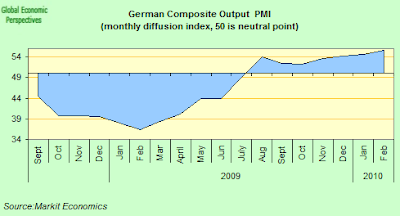 The PMI is a composite (diffusion) index in which current output - which stood at 57.4 in February, down from 60.2 in January - is only one component. Despite this slight slowdown - it was the lowest reading in three months - production increased for the ninth month running. Basically I think it is possible to divide the respective economies into three broad groups. In the first place there are a bunch of emerging economies (largely in Asia, but also Brazil, and now increasingly South Africa) where the recovery continues apace, and the only real doubt is about China, and what happens to manufacturing momentum as inflation takes hold and the central bank tightens liquidity provision. 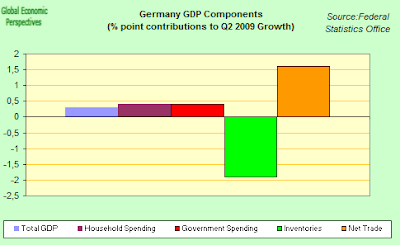 Then come the main group of developed economies, where recovery continues, but at a fairly muted pace. France stands out in this group, since despite the fact manufacturing only expands at a medium pace it is supported by strongish domestic demand. 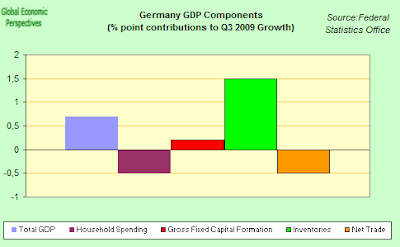 The industrial recoveries in the US and Germany seem more fragile, the former for uncertainties about what will actually happen as the stimulus effect weakens, and the later due to the heavy dependency on exports. Finally we have the stragglers - characterised by Greece and Spain - where the manufacturing sectors struggle to find oxygen. 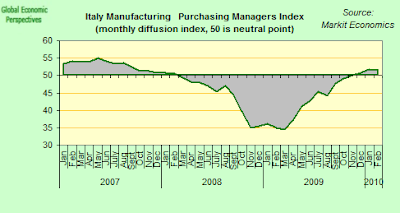 Also manufacturing activity in Ireland, Russia and Italy remains fragile. Central Europe had a positive month in February, though at this point it is not clear to what extent this is dependent on the uptick in Germany, and thus what will happen if German activity weakens. One other element is striking in this months reports: the impact of the changed USD/Euro parity. The relative weakening in the Euro meant that even though domestic demand in many cases remains weak, most Eurozone country reports revealed strong improvements in extra-Eurozone export orders. The only exception to this picture was in Greece. On the other hand, the rise in the US dollar seems to be taking its toll on exports, and the ISM survey showed a weakening in the rate of increase in new export orders. 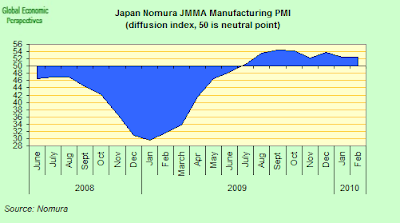 Japan however remains an enigma, since the impression given since December of a steady slowdown continues to be reinforced by the February manufacturing PMI. The reading at 52.5 was identical with January one, but both were down by 1.3 points compared to December. Export sales were up sharply in February, but the level of new business taken by Japanese manufacturers rose at only a marginal rate - the slowest in the current eight-month period of expansion. Respondents widely attributed slower new business growth to weak domestic consumption. 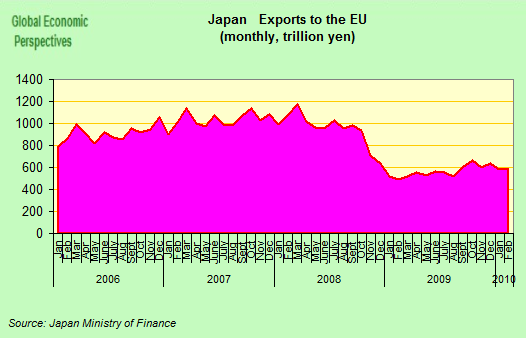 So Japan has a dual economy, and the domestic one still isn't getting traction from the export sector. Japan's exports are mainly supported at this point by demand from Asia, especially China, and it remains to be seen what will happen when China eventually starts to slow. The New Export Orders Index rose rapidly - by 3.7 points to 55.2 - suggesting that export growth gained significant momentum on the month. But with the yen trading at around 90 to the USD (compared with the break even point for export companies of 92.9 yen per dollar reported in the full year 2009 survey) this may well gradually have a negative impact on exports and thus it is quite possible that growth in exports will slow in the near future, with problematic consequences for an export dependent Japanese economy. India now seems to be leading the charge, and the seasonally adjusted PMI climbed for the third month running to 58.5 - up from 57.6 in January - suggesting a further significant improvement in the operating conditions faced by Indian manufacturers.Behind the latest rise in the headline index were faster increases in new orders, output and employment. Brazil’s manufacturing sector also expanded at a marked pace in February, although growth cooled slightly from January’s series-record performance. Both output and new orders grew strongly, while job creation accelerated again. On the inflation from survey respondents reported rising price pressures, as higher demand for raw materials, capacity constraints at suppliers and unfavourable exchange rates pushed up input prices. 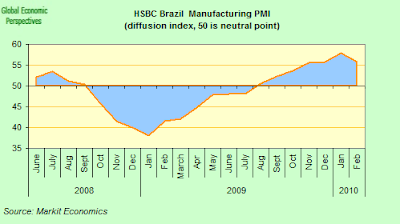 The headline seasonally adjusted Brazil Manufacturing PMI in fact slipped from January’s survey high of 57.8 to 55.8 in February. Despite the slightly weaker expansion pace the latest reading still indicates a marked improvement in operating conditions during the month. Total incoming new business expanded for the seventh month running in February, although the latest increase was the weakest since last October. Both domestic and foreign sales rose on the month, however survey responses showed that the former remained the primary driver of overall new order growth. Anecdotal evidence suggested that a combination of better global economic conditions and successful promotional activities underpinned gains in new work. 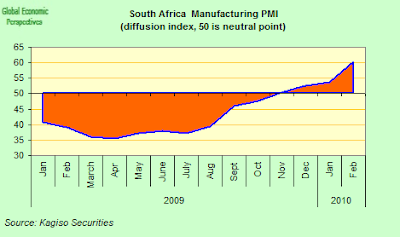 The recovery in South Africa's manufacturing sector also continued in February, and the seasonally adjusted PMI increased to 60.4 in February from 53.6 in January, according to Kagiso Securities who run the survey, the highest reading since early 2007. The biggest jump came from new sales orders, which surged by 13.2 points to 68.6 in February, while the PMI employment index increased for the second consecutive month to 52.1. Meanwhile, inflation pressures seem to be mounting, and the PMI price index climbed to 61.9 points in February. This was the highest level since early 2009, although still below the long-term average of over 69 points. On the other hand China’s manufacturing activity grew less than expected in February, as the government reined in spending and purchasing managers reported concerns about the impact of rapidly rising wages. 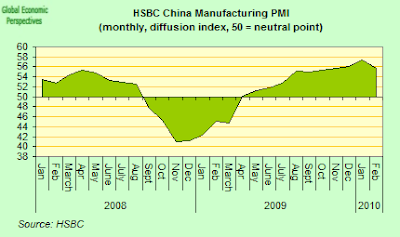 The HSBC China PMI fell to a three-month low of 55.8, down from a record 57.4 in January. An analysis of the components reveals that new orders fell 6.2 percentage points to 53.7 while - despite a strong export performance in January - new export orders fell 2.9 percentage points to 50.3. 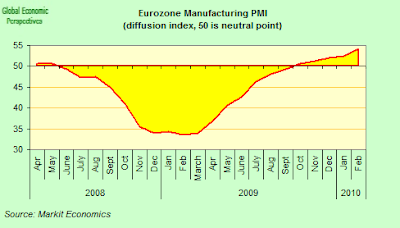 At 54.2 in February (up from 52.4 in January) the Markit Final Eurozone Manufacturing PMI posted its highest reading since August 2007 and was above the neutral 50.0 mark for the fifth successive month. The 1.8 points rise in the index was the largest improvement since last August. The headline PMI – a composite index based on measures of production, orders, employment, inventories and supplier performance – was also slightly above the earlier flash estimate of 54.1. Growth of output was recorded for the seventh successive month in February, and the rate of expansion was the fastest since March 2007. Production increased in the capital, consumer and intermediate goods sectors. The strongest rise was recorded for investment products, with growth in this sector the quickest since June 2007. However, national level PMI data revealed a widening disparity between the best and worst performing manufacturing economies. 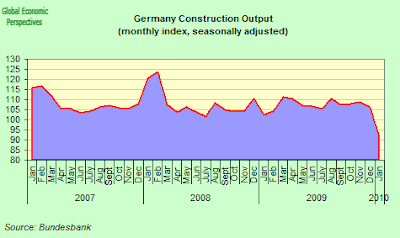 Germany registered the strongest growth of output, overtaking France. 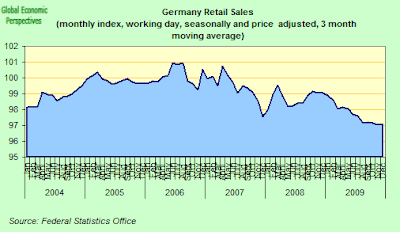 The rate of increase in Germany accelerated for the second month running to its highest since January 2007. Growth also picked up in Austria, was broadly unchanged in the Netherlands but eased in France (although the level remained reasonably strong) and Italy (where output growth remains fragile). Meanwhile, the downturns in Spain, Ireland and Greece continued. Rates of contraction in Spain and Ireland were marginal and much slower than in January, whereas Greece fell further behind the other euro area nations, seeing its sharpest fall in production since last April. 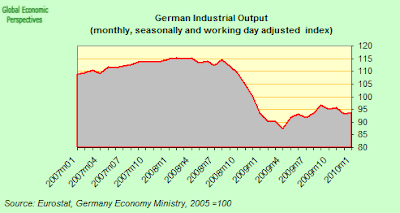 February data indicated that the recovery in the German manufacturing sector gained momentum during the month, with output and new orders rising at the fastest rates for over three years, while employment numbers fell at a much slower pace. 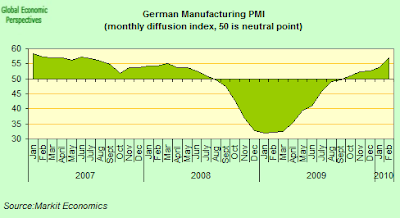 At 57.2, up sharply from 53.7 in January, the final Markit PMI was at its highest since June 2007 and above the neutral 50.0 mark for the fifth month in succession. Output levels increased in all three market groups monitored by the survey and growth remained strongest in the investment goods sector. Overall levels of manufacturing production rose at the fastest rate since January 2007, driven by improving global economic conditions and a corresponding expansion of incoming new orders. February data pointed to the fastest rise in new export orders for three years, which companies mostly attributed to higher demand from emerging markets. 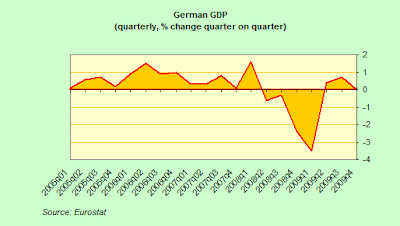 Which suggests the decline in the Euro is having a positive impact on German external competitiveness. The Italian manufacturing sector continued to expand in February, although the speed of recovery slowed fractionally from January and the rate of improvement remains modest. 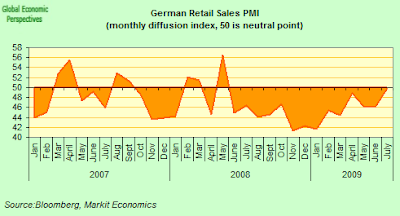 The seasonally adjusted Markit PMI registered 51.6, fractionally down from 51.7 in January. Higher output and growth in new orders also mask underlying headwinds facing what still remains a fragile recovery in Italy's manufacturing industry: job losses continue to mount, and input price inflation soared to an eighteen-month high. Nevertheless export orders have now risen continuously for the past four months, and survey respondents linked the increase to improving demand in key export nations. 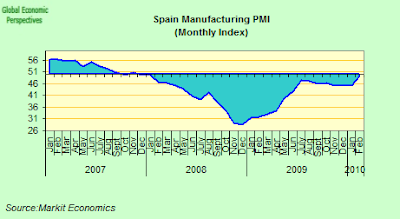 Business conditions in the Spanish manufacturing sector continued to deteriorate over the month, but the latest decline was the weakest since January 2008. New business fell at a much slower pace, in part due to an increase in new export orders. Consequently, the rates of contraction in output and employment also eased. The seasonally adjusted Markit PMI rose to 49.1 in February, from 45.3 in the previous month, showing the slowest deterioration in operating conditions in more than two years. Nevertheless Spanish manufacturing production still decreased in February, although the rate of contraction eased to its weakest in the current seven-month period of decline. 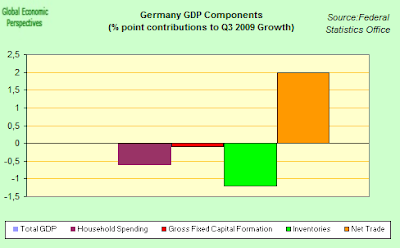 Falling output was concentrated in the consumer and investment goods sectors. Total new business fell slightly as domestic demand continued to decline, with a modest rise in new export orders being insufficient to offset the trend. The Euro decline has helped Spain somewhat, since, according to panellists, exports to countries from outside the Eurozone had been a key factor behind growth in new business from abroad. Operating conditions in Irish manufacturing firms continued to deteriorate in February, although the level of output remained broadly unchanged over the month suggesting industrial output is steadily stabilising. Total new business decreased despite a sharp rise in new export orders. The seasonally adjusted NCB PMI rose slightly to 48.6 in February, from 48.1 in January, reflecting a modest deterioration of business conditions that was broadly similar to those seen over the previous four months. The underlying weakness in domestic demand is causing ongoing problems for Irish industry. Greek industry now has the dubious title of being the worst performer globally (taking over this particular poll position from Spain) and the seasonally adjusted Markit Greece Manufacturing PMI continued to slide in February. 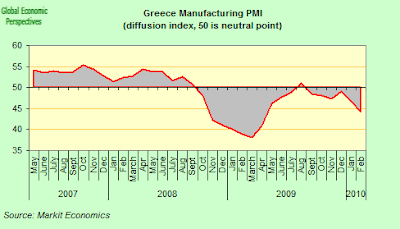 The index fell from 46.8 in January to hit a ten-month low of 44.2, signalling a marked weakening in the health of Greece’s manufacturing economy. Business conditions in the sector have worsened in each of the past six months, following a brief respite in August last year. Overall, the sector has contracted in sixteen of the past seventeen survey periods. More preoccupyingly total incoming new work fell at the fastest pace since April 2009, as both domestic and external demand receded. Data indicated that the decline in domestic demand was far more pronounced, but new export orders still decreased, albeit moderately. 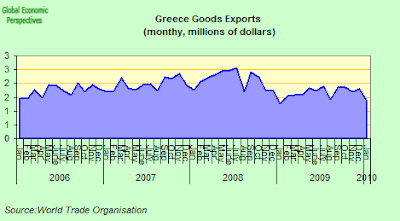 This makes Greece the only Eurozone country not to see the Euro's fall reflected in a pickup in export demand, a reflection of just how deep the competitiveness problem is in the country's manufacturing sector. Polish manufacturing industry showed a renewed recovery in momentum in February. Output, new orders and new export orders all rose at stronger rates. Having slipped the previous month, the headline HSBC Manufacturing PMI posted 52.4 in February, significantly above the long-run trend of 49.6. New orders received by Polish manufacturers rose for the fifth month in succession. The rate of growth picked up to a robust level that was comfortably faster than the eleven-and-a-half year average for the survey. Data signalled similarly marked increases in new work from domestic and export markets. 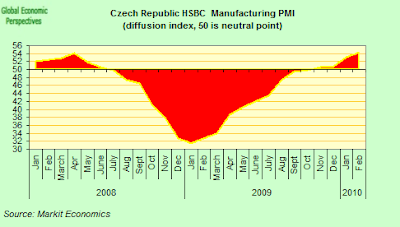 Czech PMI data continued to point to a recovery in the manufacturing sector mid-way through the first quarter of 2010. New business rose at the fastest rate for almost two years, leading to a further acceleration in production growth. 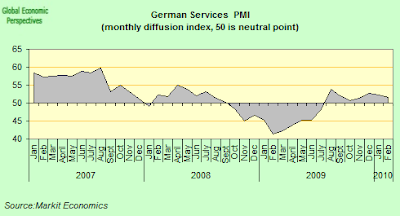 The PMI remained above the no-change mark of 50.0 for the fourth successive month, and rose to 54.3 indicating the strongest overall growth in the sector since March 2008. Growth of new orders was maintained for the seventh successive month in February. The rate of expansion continued to sharpen and was above the average for the survey which began in July 2001. Data signalled robust demand from both domestic and export markets, with the key German and French markets cited as sources of growth. 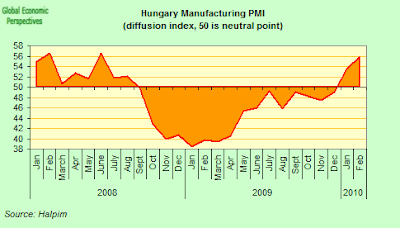 Hungary's manufacturing PMI ticked up 2.1 percentage points to 55.9 points, according to the Hungarian Association of Logistics, Purchasing and Inventory Management (HALPIM). The last time the index was at this level was in June 2008 (56.2). This is the only second time since August 2008 that the index has been above 50. (The January reading was revised upward to 53.8 from 53.5 originally). 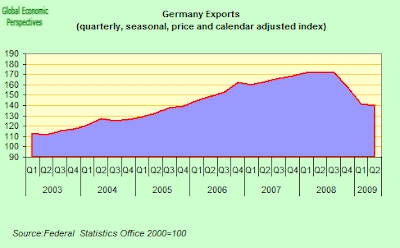 Now we need to see just how sustainable this is in terms of demand for Hungarian exports in Germany and elsewhere since domestic demand is absolutely gone and out for the count at the moment. 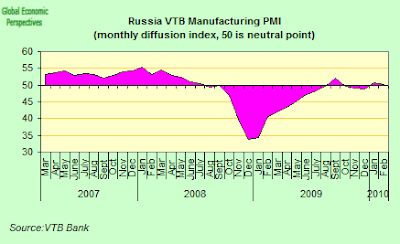 Business conditions in Russia’s manufacturing sector continued to improve in February, but the pace of growth remained lacklustre, according to the latest PMI details from VTB Capital. Output rose for the seventh successive month, although new orders increased at a weaker pace and jobs were shed at the fastest rate since last August. 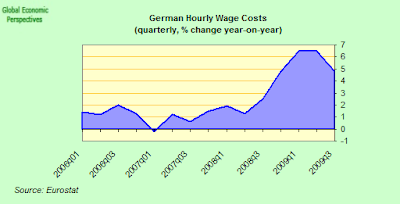 Meanwhile, cost inflationary pressures built up. The headline seasonally adjusted Russian Manufacturing PMI remained above the no-change mark of 50.0 for the second month running in February. 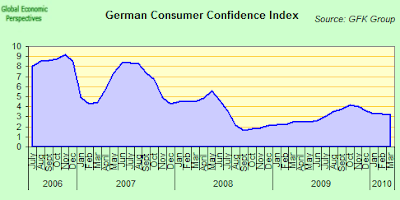 It was the first time since July 2007 that the Index has posted successive readings above 50.0. However, the latest figure of 50.2, down from 50.8 in January, suggested there had been only a marginal overall improvement in operating conditions. The drop in the PMI reading mainly reflected weaker growth of both output and new orders, and a faster drop in employment. 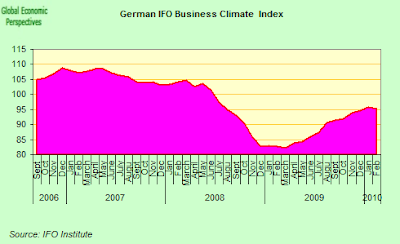 The overall improvement in business conditions was underpinned by a rise in the volume of incoming new work. New orders have increased in six of the past eight months, although the latest increase was only modest and weaker than in January. New export orders remained especially fragile, showing only marginal growth for the second month running. 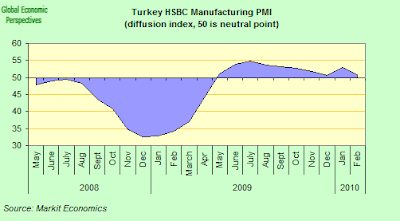 The headline HSBC Turkey Manufacturing PMI came in at 50.9 in February, indicating a marginal improvement of business conditions in the Turkish manufacturing sector, although the PMI fell back from January’s 53.0. New orders increased marginally during February, supported by improved demand, particularly from overseas. However, the rate at which incoming new business expanded fell since January, and was one of the lowest recorded during the current ten-month period of sustained increases. Similarly, new export orders increased at a slower pace during February, although the latest rise was still solid according to the survey report. US manufacturing expanded in February for a seventh consecutive month, although the Institute for Supply Management’s factory index fell to 56.5, lower than anticipated, from January’s 58.4, which was the highest since August 2004. Measures of new orders and production declined, while employment grew at the fastest pace in five years. Factories boosted production to replenish depleted inventories and invested in new equipment last year as global demand picked up following the worst recession in seven decades. 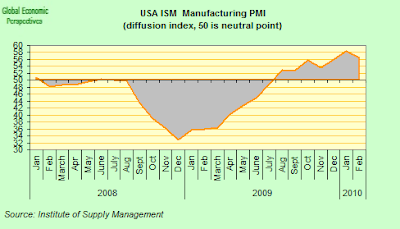 The ISM’s production index fell to 58.4 from 66.2 and the new orders index decreased to 59.5 from 65.9. The employment index increased to 56.1, the highest since January 2005, from 53.3, but the gauge of export orders decreased to 56.5 from 58.5, suggesting the dollar's rise is starting to affect exporters.